Happy Thursday! Keeping with Kerry's month long Back to School theme she challenged us to add some doodles to our creations today. I'm not much of a doodle gal, if I was, I think I would have doodled up my own stamp images by now and started a business! I've had these alterable Pencil Holders in my stash for about a year or so, and they're just perfect for Kerry's BTS theme challenge. 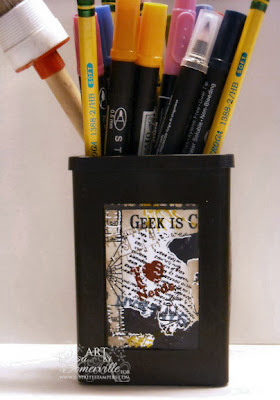 I used the Color Collage Technique to stamp images from the Geek is Chic Plate from Artistic Outpost, then sponged the edges and used a White Gel pen to add some doodles in and around the images. I used the cup to store markers on my desk, for easy clean up purposes. I do have a nice holder that holds all my ink pads/reinkers/markers, but I'm usually grabbing for the same colors all the time, so this keeps them at easy reach. Be sure to click on the Three Clover Logo on my sidebar to see what Kerry and the other challenge players created today. Stop back later to see my creations for the JustRite Mega Font Blog Hop! Wonderful pen/pencil holder. I like the idea of adding the "doodles" as accents to the images and that you used white too. Very cute and practical too! This ROCKS!!! You doodle all the time...the bandanna technique?! I also say that I am a stamper for a reason: I am good at soloring in other peoples drawings not my own! LOL!